As I posted about a few weeks ago, I have been altering that knockoff Atonement dress I have to fit the lovely niobien. I already did the work required to make the bodice fit, shortening the straps and lowering the top of the zipper. The other part that needed alteration was the hem. It clearly needed to be taken up so as not to be trod on when worn, but this dress has a long train in the back. I was a bit stumped about how to properly take up something that isn't supposed to be the same length all the way around. I pinned up the front while Carolyn was wearing it to match it to her height, but I just left the train in the back the way it was and decided I'd think about that part later. Yesterday nennivian, morethings5 and I had a little bit of a sewing party at my house, all working on various projects. I pulled out the dress and solicited some opinions. Jonathan suggested making sure it was taken up the same amount all the way around, while Charlotte said it could probably be transitioned from the new length into the train. I ended up combining these two. I measured the distance from the waist seam to the new length, and determined it was taken up by four and a half inches. So to keep it even, I took up the hem by four and a half inches all the way across the front. Then, once I had the front all even, I just carefully folded a smooth transition from that into the train. Today I pressed the crease of the new hem so that it would be sharp and flat, then I laid the dress out as flat as possible to check if it was even and balanced. Not too bad, huh? That darker fabric crumpled up in the center is the lining. I will figure out what to do with it after I finish the real hem. My plan was to sew in a blind hem by hand. 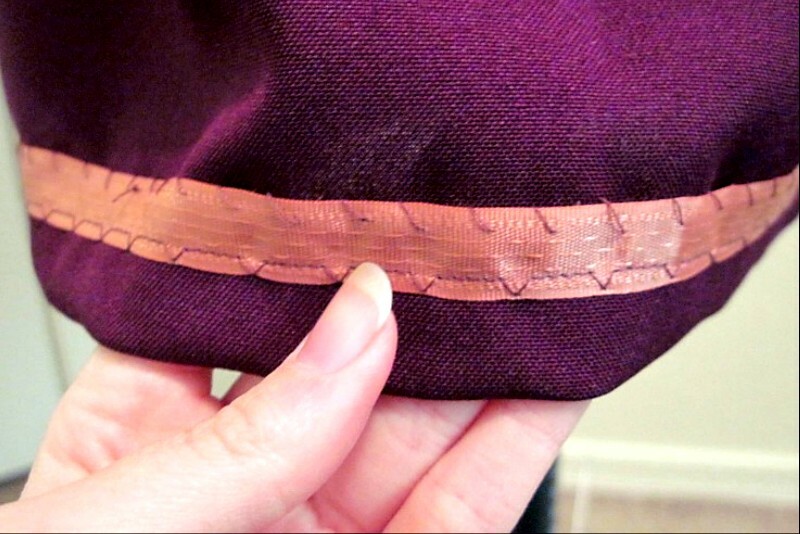 A blind hem is when you keep the stitching holding the hem up invisible by only putting the needle through a few threads of the fabric rather than punching all the way through to the outside. I knew it would be a lot of work on a hem this long, but it was the proper way, and it can't be done truly invisibly by machine. But when I tried it, I found the fabric would not allow me to pick up any of its fibers just on the back, even the slight picking with the needle pierced it all the way through. So much for the blind hem then! I had no choice but to choose a method where the stitches would show. The way the original hem was finished was just a tiny bit of a fold over with a line of straight stitches very, very close to the edge. I decided I would do the same. I loaded my machine with a green thread my mom's had in her sewing stuff forever which just happened to match the dress perfectly and ran a line of stitching all the way around the new edge, then pressed it. It came out neat and seems serviceable, except there is so much material tucked up behind it that it's flopping down. If I'd been able to do the blind hem I wouldn't have had to worry about it, as I could have put the seam up high enough to hold that extra up, but I didn't want a visible line of stitching four and a half inches up the skirt. I'm not sure what the best way to deal with it is, though I guess I will probably have to cut it off. As I recall when I opened up the back of it, the material is a bit ravelly, though not too bad. I'm slightly resistant to that as it may make it a bit ugly on the inside, but I guess it doesn't matter too much. For that matter, if I just wanted to hack the inner lining up to the right length, it will be concealed as well, which would save me some labor. I can't wait to try it on Carolyn again, I'd love to see how it looks! Have you considered hem tape? Think like this, except with no stitching. It goes over the hem and you iron it to heat up the fusible side. 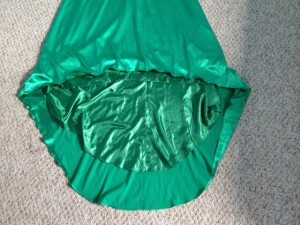 You can also get the fusible webbing that goes inside the hem and doesn't show at all. I've used both methods for work pants where I didn't want stitching to show. I thought about hem tape, but I've heard you can't count on it to be permanent. But the webbing is a great idea, thanks!